Writer Nancy Oliver: "Is this what I'm supposed to be doing?" When Alan Ball offered you a staff writing job on HBO’s “Six Feet Under,” you were literally getting ready to leave town and give up on your writing career. Why is that? When I moved out here I decided that I would give it five years because I’m not a kid anymore. When Alan called, I was moving because my five years were up. It was very difficult because I was doing it at a later time in life than most people. I didn’t have the years to screw around. I was going to go back to Florida, find a place on the beach and figure out another way to make a living… But after the first day [of thinking about it], I was like, “What? Are you crazy? Yeah, I’ll do this!” Then I was clearly onboard. 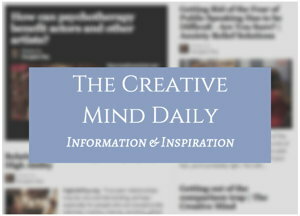 How do you battle writer’s block, if you get it? There’s plenty of struggle, no question about that. I had had a block . . . for five years and I wasn’t sure that I would ever be able to write a big piece again. I’ve been working since I was 21, trying to put it all together, and hit just one dead end after the next. How did your writing habits change as you went from writing by yourself to being part of a writing team? “Six Feet Under” changed me a great deal, and it was a wonderful training ground that really toughened me up. I’d been sensitive for quite some time and when you have to put your stuff on the table and let everybody go at it, it either makes you stronger or kills you. I really enjoyed it because I got so much out of getting other people’s opinions. I think I’m a braver writer now. Less wimpy. 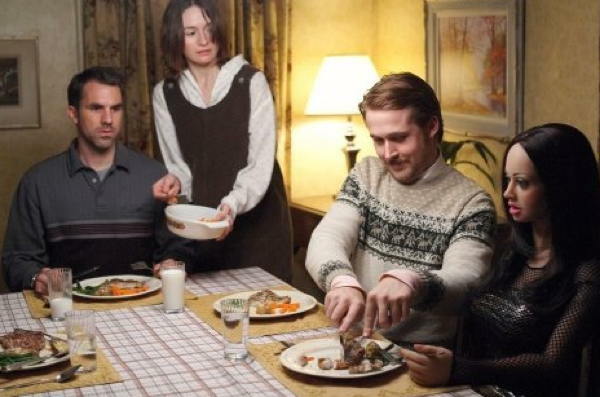 The photo (from imdb.com) shows Ryan Gosling as Lars, at right, cutting food for his doll companion Bianca, at a meal with Paul Schneider and Emily Mortimer. Sensitivity and identity questions are relevant for many writers and other artists, and a number of mental health issues addressed on the site may be of interest in terms of self-exploration, and story material.